State Member for Ferny Grove Geoff Wilson has released his November update, which was distributed via email to subscribers. It doesn't look like the update is available yet on his publications page but I am hosting it here . Along with the usual page-filler PSA sections the news letter contains some details of community events including the Railway Upgrade information sessions, Community Cabinet session (on December 5 in Albany Creek) and Christmas events. I've posted and opined about the Ferny Grove Railway Upgrade and Proposed Precinct before. This week the mail delivered the 4th issue of the Railway Upgrade Newsletter. The awning over the city side of the station and pedestrian crossing will be removed at night between November 29th and December 2nd. Work in early 2011 will include construction of a temporary platform, changes to road access from Samford Road and the move of all bike lockers on the Samford Road side. By mid 2011 additional parking on the site of old tavern will be available. Through travel between Samford Road and Convalla Street will not be possible by car or on foot. The bus stop will have been relocated. The Community has chosen 'Vision 1' out of the 2 precinct visions presented. This vision allows for a new tavern to built later as part of the precinct program. Therefore, the tavern may yet reappear as part of the precinct. Additional consultations regarding the upgrade will be held with the community on November 29th and December 2nd at the Ferny Grove bowls club, at 10am and 4pm respectively. While doing some more internet searching I also came across this forum discussion which has been ongoing since 2009 about the upgrade. For additional opinion and history on the subject, check it out. November is National Novel Writing Month. I am not sure why the word national appears in the title, since it seems to be an international event. The novel writing month centers around a challenge for participants: Write a 175,000 word novel between the 1st and 30th of the month. Given the short time frame, the focus of writing is on quantity over quality and encouraging aspiring writers to abandon perfection for sheer output. What puts this on the radar of Ferny Blog is that a group of participating Brisbane residents are organising a group day long writing activity on QR City Trains. They call it a Roving Write In. This Sunday, November 14, aspiring writers will be travelling the breadth of the Ferny Grove, Petrie, Cleveland and Beenleigh city rail lines, draining laptop batteries or sharpening pencils as they (presumably) draw inspiration from each other and the journey. If you are interested you can join the group at Ferny Grove on the train departing at 12:28pm, or meet up with them sooner on another line. Refer to their organising discussion for more information. If you are thinking of going to the Jan Power Farmers Market at Michelton, make sure you stop by at a teller machine prior if you are low on cash. All three ATMs on Blackwood Street were out of service today. A stall owner I spoke with wondered if the banks were keeping the ATMs offline out of business hours to reduce the risk of theft and attacks against the machines. In the past year Blackwood Street has seen more than a couple of armed robberies. Despite the inconvenience of customers and the possibility of lost sales by store owners, the Market appeared very popular today, with a range of fresh produce, pastas, curries, preserves, breads, meats and the inevitable German sausage. Entertainment was notable and varied without being overdone. The Jan Power Farmers Market is held on Blackwood Street, Michelton, on the first Sunday of every month. The October 2010 Brisbane West District Crime Bulletin, produced by the Police district of the same name, is available here (172Kb, PDF). The new Police Link phone number 131 444 for non-urgent police matters is being rolled out. Some community events were announced, all for the month of October, which we have obviously missed. Opinion: The Queensland Police website does not make a lot of information available. The information it does have is somewhat hard to access. Sure, I can request additional information (application fee: $38 plus processing fees) but I am sure there is a lot of obviously interesting public information that should be more readily available. I don't mean to pick on the police here. Just government. Rant ends! The NEiTA (National Excellence in Teaching Awards) organisation has announced winners of their Inspirational Teaching awards for 2010. Ferny Grove State High School teacher Stephanie McCaw was among the recipients. Stephanie McCaw's NEiTA profile (PDF) describes how she has advanced the teaching of Music at the school considerably since she started full time in 2000. Stephanie McCaw was nominated by a school parent. Last Steam Train to Ferny Grove? I haven't found any confirmation about this, but the True Local / North West News website is promoting an event for the last ever steam train to Ferny Grove on Dec 12, 2010. Tickets can be bought at the Jan Power Markets (Blackwood St, Michelton, 7th Nov or 5th December) or at Bendigo Bank. If its true, QR has not yet updated its Steam Train Sunday webpage, which promotes the Roma Street to Ferny Grove steam train ride until the end of the year. Neil Ennis is an avid cyclist and blogger who is exploring the sites of the old Ferny Grove to Dayboro line. His blog entries describing his exploration are brief, interesting and supported with photos of his journeys. In this weekend blog entry Neil sets off from the Ferny Grove line terminus along the route of the old railway line. 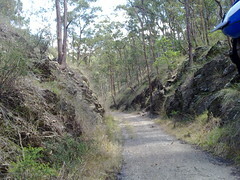 The railway continued along from Ferny Grove station along what is now Lanita Road. An easy path follows the route off road at the end of Lanita road, and continues through to Camp Mountain. I've walked the path a few times, but I can never find the memorial at the end. It looks like Neil found it without any problems. I've never met Neil, but this particular blog post (and the series) caught my attention.